The Extenso® Cab is flexible to perfection, it can carry 3 people or increase the length and volume of load space. • An optimized width between the rear wheel arches. 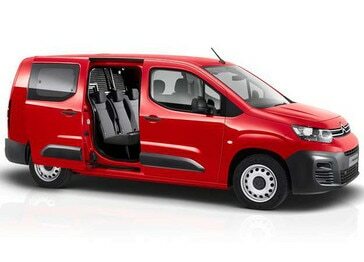 New Citroën Berlingo Van offers up to 4.4m3 of load volume and its payload ranges from 650kg to 1000kg. The Overload Indicator available on selected versions informs you if the payload has been exceeded. The Loading Pack makes everyday life easier with enhanced LED lighting, 4 additional load securing rings and a 12V socket. With the Extenso® cab, you can work in comfort thanks to the adjustable writing table when the central seat back is folded down. The roomy modular cabin is built for teamwork. Available in XL, its second row of seats offers unique comfort with record knee space in its class. *Crew version available from early 2019. Thanks to its modularity, it enables the carrying of long loads when the row 2 side seat and front passenger seat are folded down. To increase the load volume, row 2 can be folded down and the load-stop mesh bulkhead slid forward to the back of the front seats. For maximum volume and length, it is also possible to fold down row 2 along with the front passenger seat. Practicality is one of the keywords that guided the design of New Citroën Berlingo Van. Generous with space, it offers nifty storage options in the cab for everyday objects, from the smallest to the most bulky. Between the storage box under the driver's seat or the passenger's side, the TopBox, a lower storage compartment, an overhead storage unit,the large door bins and cupholders, it offers 113 litres of ergonomic and easily reached storage spaces. 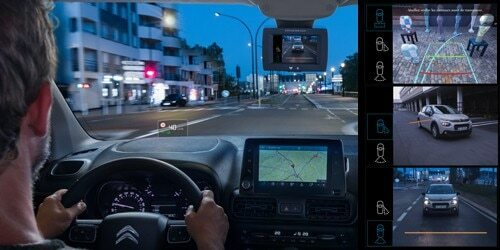 Citroën Connect Nav is a 3D connected navigation system with all the features that matter, benefiting from voice recognition to control the Navigation, Phone and Media functions without you needing to take your eye of the road. You also benefit from connected services such as TomTom Traffic for real time traffic information. This brings you details of service stations, car parks and weather conditions. Standard equipment on the Worker version, Grip Control with Hill Descent Assist minimises slip and keeps you in control on steep slopes. 30 mm more ground clearance, a protective plate under the engine and larger wheels with Mud & Snow tyres complete a confidence inspiring package. Discover the International Van of the Year, New Berlingo Van miniature. The fluid lines and energetic exterior style of New Berlingo van has been scaled down to a 1/64th model, available in 3 colours: Blue, White and Red, so you can expand your collection in style.